The original FordLogan heavy-gauge wire partitions are structurally strong to assure years of service with little maintenance. 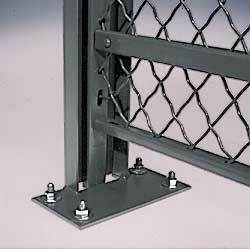 Constructed of 10-gauge, 1-1/2" diamond wire mesh that is securely clinched to frames. Vertical frames are 1-1/4" x 5/8" roll-formed “C” channels mortised and tenoned at the corners. Horizontal frames are 1" x 1/2" roll formed steel. Center channels provide extra reinforcement. Top cap channels are constructed of 1-1/2" x 1/2" x 14-gauge roll formed channel with bolt holes in-line with panel's top bars. 1-1/4" x 1-1/4" x 11-gauge hot roll formed angle steel makes up the corner posts. Line posts3-1/2" x 1-1/4", 10-gauge. Die cast aluminum base shoes are 2" high. Gray polyester powder coat paint finish is standard. All necessary hardware furnished. Bronze cylinder mortise type locks are standard on sliding or hinged doors. SELECTED MODELS FACTORY QUICK SHIP. ALL FOB INDIANA. Line posts are recommended if interior supports such as building columns, ceiling joists or other bracing is not available. Recommended to be used every 10 ft. Required for each 90° corner of partition; size 1-1/4" x 1-1/4"
5' WIDE PANEL WITH SERVICE WINDOW. Comes with a service shelf and catches to hold the window open or closed. Window opening is 24" W x 21" H.
Adjustable steel panels adjust from 2-1/2" to 1'. NOTE: Transom panels are furnished with partitions higher than 7' only. Can be purchased separately, call for information. NOTE: Price includes service window and panel. XL-326 For masonry, wood and steel walls. Pkg./4	 Pkg./4.